"Amok Time", what a great episode. I first watched this episode a few years ago in syndication one late night when I was free. It was absolutely wonderful. 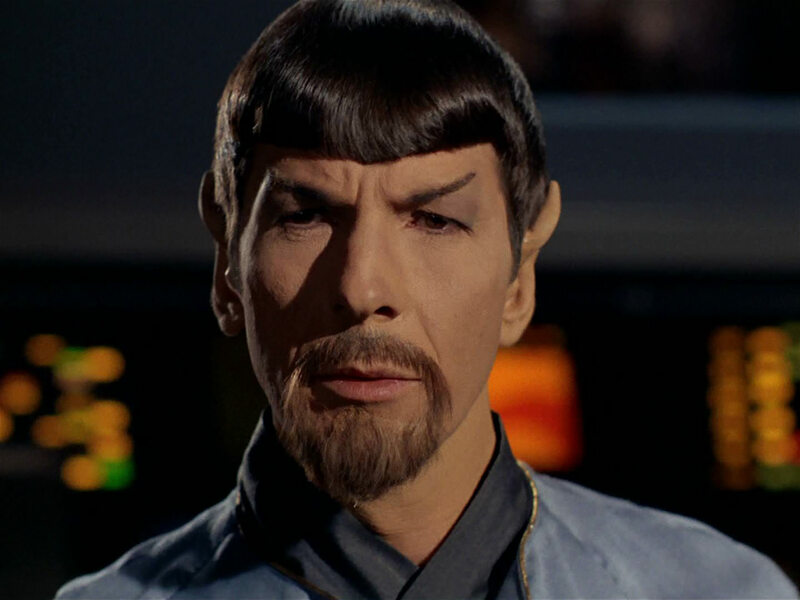 The acting was the best of TOS, Spock's especially. His reactions where absolutely perfect for the situation. I also enjoyed the music. The guitar riff was something new for Star Trek. The episode centers around Spock going through pon farr, or the urge to mate. They travel back to Vulcan, where Captain Kirk faces off against Spock. This was a big deal because Spock and Kirk are the best of friends. They wouldn't fight, and showing this shows exactly how irrational and illogical Spock was, and it explains to the audience just how powerful the pon farr is. The audience also sees Vulcan for the first time. It is a rocky world without many cities. Or at least, not many cities that can be seen. In this episode we also see a lot of Vulcan culture, which is very cool. Watch out! Star Trek goes sexual! And for once, it's not Kirk getting all the action. This episode is one of the best (and most popular) of TOS. I've always thought that the approach to Spock's madness was very well done, and well acted. Nevertheless, it also has some unintentionally funny moments. Remarkably bad prop: Spock beats up his computer with his fist, but it smashes apart like clay or paper. Stardate 4202.9: The Enterprise receives a distress call from the USS Constellation. When the Enterprise reaches system L-374, they discover the crippled Constellation with her captain, Commodore Matt Decker, as its sole survivor. 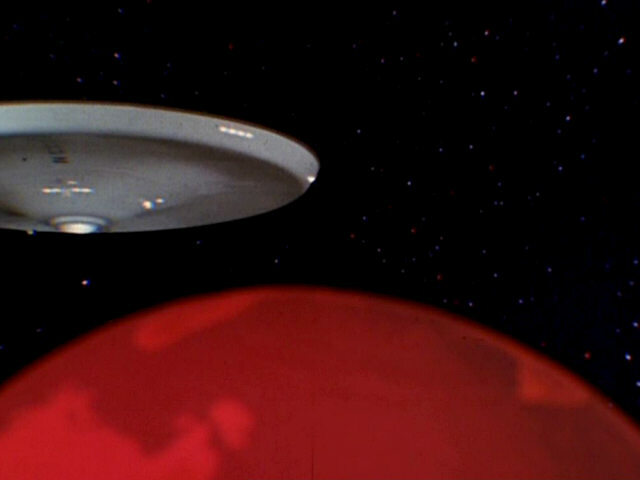 Decker tells Kirk that his ship was attacked by a "planet killer". Decker explains that he beamed his crew down to the third planet of the system. The entire crew was killed when the planet killer destroyed the planet. Decker then beams over to the Enterprise while Kirk and Scotty remain on the Constellation. Decker then assumes command of the Enterprise when Spock refuses to prevent the planet killer from proceeding to Rigel. His attempt to destroy the planet killer fails and the Enterprise barely escapes with the help of the crippled Constellation. Spock then relieves Decker of command under the authority of Kirk. Dejected, Decker then hijacks a shuttlecraft and flies it into the maw of the planet killer. Decker is killed instantly. The plan failed but it inspires Kirk to fly the Constellation into the planet killer himself. Scotty rigs a thirty second delay to the impulse engines which will overload when the timer reaches zero. Kirk then proceeds to fly the Constellation into the maw of the planet killer and then engages the thirty second timer. Kirk then asks to be transported back to the Enterprise, but the transporter is not functioning. Scotty manages to repair the transporter and Kirk beams aboard just before the impulse engines explode. The explosion destroys the planet killer. 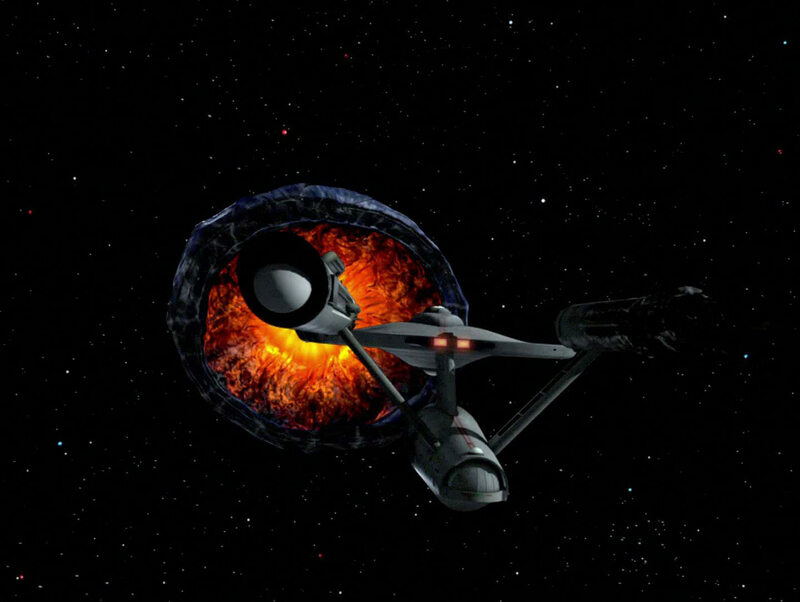 "The Doomsday Machine" is by far the best Original Series episode ever made. The script was well written, featuring many memorable quotes. The storyline is also beautifully written. William Windom does a fantastic job portraying Commodore Matt Decker. The special effects are a little weak, as they all were in the 1960s, but they are fun to look at. This episode has a lot of action in it, which is why I think it's the best. But another thing that makes this episode truly fantastic is it shows a Starfleet officer suffering from a severe mental breakdown and strong delusions (Decker). I highly suggest this episode to EVERYONE. Funny miscue: The Constellation appears barely damaged, even though almost all its systems are shot. I guess the special effects team did the best they could with a Constitution Class model and a soldering iron. Famous dialogue: Decker: "They say there's no devil, Jim, but there is, right out of hell I saw it." Kirk: "Matt, where's your crew?" Decker: "On the third planet." Kirk: "There is no third planet." Decker says sobbingly: "Don't you think I know that? There was, but not anymore! They called me, they begged me for help, four hundred of them! I couldn't, I..I couldn't!" This was probably the first Star Trek thing I ever saw, and it made quite an impression on a blank-minded 3 year-old at the time. Even today this remains my favorite Star Trek episode. But looking at it from the series perspective? We get treated to a full model rather than a blinking light effect, we get several suspense scenes and a fight scene that Kirk is actually not involved in (I bet nobody saw that coming). The Constellation always looked smaller than the Enterprise (I later found out it was an AMT model damaged with a soldering iron) and even in the Remastered this doesn't seem to be corrected. Other than that I didn't find anything wrong with it. Nitpicking: Though it would have been useless, why didn't Decker try firing torpedoes? Many sources say they are x times as powerful as phasers and Decker, as a commodore, should have known that. Remarkable scene: The Constellation flying into the Planet-Killer, a great suspenseful scene. Remarkable ship: The Planet-Killer, probably one of the most basic yet most complicated designs yet (basic as in a paper-mâché cone spray painted blue, complicated as in all the technobabble going with it). Stardate not given: While trying to persuade the Hawkins to allow Starfleet to mine dilithium on their homeworld, an ion storm causes the transporter to cross time and space, sending Kirk, McCoy, Scotty, and Uhura to a parallel universe (and their mirror counterparts to their own universe). In this dimension, the ISS Enterprise (representing the ruthless Terran Empire) has threatened the Hawkins to let them mine their dilithium or the ship will open fire. Even though the Halkans' time to consider has expired, Kirk (undercover as his mirror counterpart) extends that time limit, shocking his bridge crew. Mirror Spock becomes suspicious of Kirk. Mirror Chekov and his private henchmen try to kill Kirk in a corridor, but Kirk fights back and sentences Chekov to the agony booth. You know what, just go look at EAS's summary, this is taking too long. The Mirror Universe is one of my favorite plot lines in the entire Trek franchise. It is a perfect allegory for Humanity's dark side, and how society could be drastically different if that dark side is allowed to flourish. I've always wondered what Imperial Earth would be like in this universe. Would is be like ancient Rome, with giant pillars and villas, and an ordered society, or would it be a run-down, individualistic disaster area where people do whatever they please at the cost of others, like something out of A Clockwork Orange. I've also read David Mack's novel The Sorrows of Empire, which tells of Mirror Spock's rise to leadership after the events of the original episode. I highly recommend it. Remarkable acting: Throughout the episode, Kirk's portrayal of his mirror counterpart is highly unlike the actual character. Mirror Kirk is vicious, courageous, and fearless, while our Kirk is calm and remote. No wonder Mirror Spock was suspicious! Remarkable scene: The fight between the regular crewmembers, Spock, and Sulu in sickbay. Remarkable fact: The closing scene with Kirk and Marlena on the bridge would later be used as the closing scene in DS9: "Trials and Tribble-ations", with Marlena being replaced with Captain Sisko. Stardate not given: OK so we know the Story, the Enterprise gets a distress call from the SS Beagle with someone Kirk knew from the Academy who flunked out. When they finally meet we find that some of the crew has assimilated with the "Roman" society, the rest went to the games to die as Barbarians. The Proconsul wants to coerce Kirk to get more Enterprise crewmen down to participate in the games, the Proconsul (who seems quite up on the Prime Directive and other Star Fleet Regulations) seems to have Kirk in a legal bind, knowing he can't interfere with this culture and order the Enterprise to effect a rescue or torch the planet surface, he's trying to get Kirk to just order then men down there because sooner or later, they will come just like the Beagle's crew did. I will submit that because of Merik himself and the guards who train their guns on Kirk when given a communicator (knowing he can transport) that this planet is already contaminated to a degree. These guys don't bat an eye over advanced technology like communicators and beaming, the guards serve regardless and unfazed. I thank Kirk could've have given them another General Order 24 as in "A Taste of Armageddon". This society would have been far less capable of defending itself then Eminiar 7 and given up. Which brings another point. The Proconsul is aware of the Beagle and its technology and all he is concerned about is bringing more bodies in the gladiator games. The Beagle carried lots of advanced technology (like Phasers) that could have made the Proconsul a very rich and powerful man. What he couldn't get from the Beagle he could have more then acquired from the Enterprise. Unlike in "A Piece Of The Action" where Kirk tried to put ideas in the head of Jojo Kracko's men in "A Piece of the Action" that "having a phaser could make a man a pretty big boss himself". These guys were totally uninterested in acquiring more power, (or even telling the Senate "Hey there are Aliens here and the Proconsul is hiding them! "), they just care about getting more victims for their games - apparently no one cares where the bodies come from just as long as they are there. Scotty could've (for example) interrupted the video feed and exploded a torpedo high above the city and would have had everybody panicked, including the Emperor and the Senate - whom I'm sure don't know about the "Aliens" among them. Kirk could have threatened to wipe out the Empire and no one from the Federation would be wiser - I'm sure the Proconsul would have bent. But as I first watched this when it first came out in 1968 and again today I am still bothered by the banter when McCoy as they are both trapped in jail decides he's going to trap Spock and try to poke holes in his logic following him around the cell trying to get him to break then seeming to be glad when he sees Spock crack and going for Spock's jugular. "Do you know why you're not afraid to die, Spock? You're more afraid of living. Each day you stay alive is just one more day you might slip and let your human half peek out. That's it, isn't it? Insecurity. Why, you wouldn't know what to do with a genuine, warm, decent feeling." - The same as the uncalled for harassment in the "Galileo 7". When the rest of the crew is thinking survival he rather come close to badgering Spock for being in command. Both those and other incidents are uncalled for and have given me a bad taste on the McCoy character. Remarkable dialog: The humor of Spock and McCoy came out in the games when Spock's opponent says "Fight you pointy eared freak!" and McCoy (while getting his shield pounded with a sword) yells back "You tell him Buster!.." The Roman Police wasn't bothered by Spock's ears, automatically assuming he was a Barbarian. They've seen Barbarians that look like him? Might a biological study seem more in order like "Patterns of Force"
It appears the "Roman Empire" doesn't dominate the whole planet. With the reference to Barbarians perhaps beyond the borders and the Enterprise being a ship out to sea. Remarkable quote: "You bring this network's ratings down, Flavius, and we'll do a special on you!" I am beginning to think this episode may be more about the greediness of network television then the parallel to the Roman society. Stardate 2530.4: The Enterprise goes to the planet Ekos in search of scientist John Gill. Kirk and Spock are surprised to see Nazis on the planet when they beam down. They find that Gill is the planet's führer! Kirk and Spock now must find Gill and get him to end this planet's Nazi regime. They then steal some Nazi uniforms, but are quickly discovered and imprisoned. Kirk and Spock then manage to escape and get the heavily drugged Gill to tell the people that he has been manipulated and that the must stop a planned invasion of a nearby planet. Gill is then assassinated but the crisis is already over. This is one of the only times I actually disagree with Bernd. I find this episode to be quite entertaining. Yes, it may be distasteful and share a similar plot as other episodes, but the plot of fixing a violation of the Prime Directive never gets old. The idea of Nazis existing in another part of the galaxy is a bit odd, but it still makes for a good episode. This is one of my favorite TOS episodes. So watch it, and see what you think. Patterns of Force is an Original Series episode that fulfills only a specific set of dead cultural niches. While it's commonly mentioned that the cheapness of re-using Paramount's extensive WW2 sets and costumes was the motivation for filming it, I think a lot of the consternation about this episode concerns the seemingly irreverent way it tackles its subject matter. I'd like to assert that, instead, the way the episode handles it subject matter is merely outdated to the point where people have utterly forgotten the conventions behind it. None of this insight really saves this typical excuse plot from being tripe but I think it's worth establishing some perspective on it. The easy path to a Neo-Nazi regime in science fiction dates back to somewhere around the 1950s, mainly because, at the time, the amount of information available on the subject was a bit limited. The acts committed by the Nazis, their various crimes, and some of the means in which they bent the German economy and culture to their will were known, but historians still needed a decade or two to deeply research and piece together the full story on everything. So, sci-fi writers read up on what they could, and then filled in the gaps with their assumptions. Sci-fi writers have a frustrating tendency to make assumptions on ridiculous scales. Evidence at the time pointed to the idea that the Nazis perhaps had some set of advantages that history hadn't quite defined. So, naturally, science fiction writers unwilling to do intense research on the subject just assumed that the Nazis, through either intellect or willpower, had stumbled on some kind of secret technique to build an unstoppable military machine. It would only be later on that further research would dismantle the idea and reveal the Nazi regime to be little more than a set of the usual political cons and fear-mongering, just one that met success more out of luck than anything else. The darker flipside to this is the deep paranoia that arose concerning Neo-Nazi movements after the war concluded. America suspected for a long time that some resistance movement would form in Germany, or that other countries would fall to Neo-Fascist regimes up to and including Neo-Nazis. Neither of these materialized postwar, and so the paranoia shifted to America itself. Particularly more progressive-leaning authors who felt that the USA in particular has always been vulnerable to the rise of a Neo-Nazi regime, mainly because America has maintained the ultimately questionable practice of letting small Neo-Nazi movements operate openly under its free speech laws. That fear has been on and off for decades. Reframed in this context, Ekos is not some random alien culture but perhaps a pastiche of the USA itself (the "warlike" line has Gene Roddenberry's disdain for then-current events written all over it). This does little to help the excuse plot of the episode considering Gill never explains himself or what his goals were, but at least you can see the inkling of a once-decent story idea in that premise. Last of this episode's outdated conventions, and perhaps the most shocking to modern viewers, is the seeming irreverence both the script and actors have towards the idea of dressing as Nazis and having to experience Nazi ideology up close and personal. It's easy to forget now, but this attitude was not irreverence and more one of triumph. Jews and people of Jewish descent reacted in a spectrum of ways to the horrors they were subjected to, but one trend that caught on in American postwar culture was an attitude of constant demeaning of the Nazis. Jewish soldiers collected tons of war trophies to take home, including medals, uniforms, etc. There are even occasional vintage photographs of them wearing said trophies. After all, what could be more openly insulting to the Nazi ideology than one of the "inferior races" dressed in their own regalia? On top of all of this, Nazis were intentionally written to be buffoonish, swaggering, idiotic characters who failed spectacularly at almost every task they attempted to take on (Hogan's Heroes comes to mind). This almost slapstick take on the idea would persist until the 1970s or so, when the next generation of audiences, feeling distant enough from the war years having never experienced anything like them, no longer felt the need to maintain those caricatures. But as a product of the 1960s, Patterns of Force is no different. Even with the benefit of this perspective, Patterns of Force is still a garbage episode of the Original Series. The fact that the genre conventions it followed so closely are nonexistent these days only highlights the fact that it was provincial to an absurd degree, based solely on a specific American interpretation of the mechanics behind the Nazi regime. Even then, the episode utterly fails to meditate on its subject matter or raise any compelling questions. Even the jokes Nimoy and Shatner crack between each other in uniform are underwhelming; lacking the teeth for any kind of cynical dark humor and of course being just a bit too unsettling to be lighthearted. If a Star Trek fan is aware of the TOS convention of having identical Earth-like worlds with identical human cultures present on them, they'll typically remember one of two episodes that used that convention. If they liked the trope and found it a fun way to kill a filler episode, they'll mention A Piece of the Action. If they hated the trope and always thought of it as detrimental to the series and maybe even the franchise itself, they'll mention Patterns of Force. I think that speaks for itself. Remarkable cheapness: While maybe one can argue the necessity of reusing the props and sets on hand to save on the budget, there is simply no excuse for the amount of actual Nazi stock footage on display. Even in the 1960s everyone saw this crap a million times over, making its inclusion glaringly obvious. Remarkable imagery : Perhaps remarkable to film buffs and nobody else, the props and uniforms feature a surprising amount of detail in the use of Nazi symbols and imagery, though often inaccurately arranged. Only a decade later this sort of thing would go missing to the point of outright historical inaccuracies, somewhat out of cheapness and somewhat out of a desire to make people less touchy about the subject matter. Remarkable set: Apparently the Nazi capital building was the damn Paramount offices with Nazi materials draped on them. Can you even imagine what the reaction would be like if a major studio tried that today with their own office buildings? Remarkable quote: "Even historians fail to learn from history." - John Gill. I beg to differ, ironically historians these days would be the first to shoot down all of the Nazi myths this episode buys into. Reputable ones, anyway.